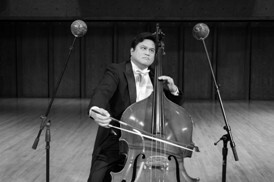 After graduating with a BM from Indiana University (Bloomington) as a double bass student of Bruce Bransby, Jeremy Baguyos began an orchestral career that included full-time appointments with the Orquesta Filarmonica de GC (Spain) and the Shreveport Symphony as well as freelance engagements that included, among many other groups, performances with the Kennedy Center Opera House Orchestra, the National Symphony, the Milwaukee Symphony, and the Spoleto Festival Orchestras. He has performed under the batons of Leonard Slatkin, Mstislav Rostropovich, James Levine, Andre Previn, Placido Domingo, and Valery Gergiev. Highlights of his solo and chamber music engagements include appearing as soloist with the Columbus Philharmonic (Indiana), multiple appearances at the International Society of Bassists Convention, and performing the solo double bass with the Orquesta Filarmonica de Gran Canaria on the Fourteenth Symphony of Dimitry Shostakovich. In addition to membership in the Lincoln Symphony, Mr. Baguyos is Principal Bass of the Des Moines Metro Opera Orchestra and Associate Professor of Music Technology and Double Bass at the University of Nebraska Omaha. He holds a Master’s Degree in Computer Music from the Peabody Institute of Johns Hopkins University and is active nationally and internationally as a composer, performer, and researcher in the field of academic computer music, with notable presentations at the ICMA International Computer Music Conferences and publications with the MIT Press and ICMC Proceedings. Mr. Baguyos was born in Quezon City, Philippines and was raised in Overland Park, Kansas. He resides in Omaha, NE with his wife, two children and dachshund. In his spare time he enjoys biking, watching the Kansas City Chiefs, and spending time with his two children. If he had to do it all over again, he would be a stand-up comedian.